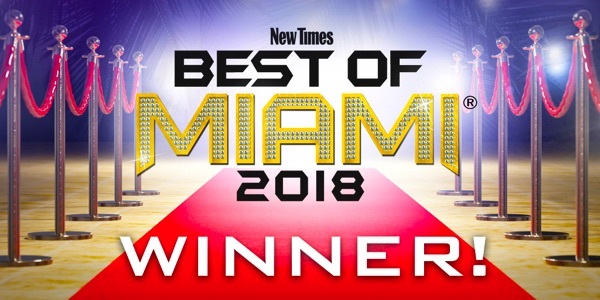 There are a number of things that have upset folks in Miami about the attempt of Francis Suarez to become the Strong Mayor of Miami. Without question, the first and most important issue that's upset a lot of folks was the way in which Suarez tried to mislead and obfuscate how much money he would be paid in his his new position of Strong Mayor: the whole 75% of the Miami-Dade County Mayor's salary thing. Coupled with that issue was Suarez's unwillingness to accept as part of the deal was that if he wanted to be the Strong Mayor, then the citizens in turn had a right to expect that for the increased salary, which the Miami Herald reported on August 6th would be $244,500 - an increase of $147,500 from his current salary of $97,000 - that he would become a real full-time mayor, and put his law practice as a land use lawyer on hold. He's refused to even consider that, telling anyone, and everyone who asks him that he has an obligation to look out for the well being of his family and that the salary and benefit package that he would receive as the Strong Mayor would not provide him enough money to do that, especially now that he's gone and purchased a $1,45 million home in Coconut Grove. The notion that Suarez believes he can portray himself as a man so concerned and dedicated to the city's well being, that he wants the citizens to give him almost unlimited power to run the city any way he wants, and then claim that he can only be a part-time Mayor because he needs to moonlight as a lawyer to make ends meet is a truly amazing demonstration of chutzpah. No one put a gun to Francis Suarez's head and made him choose to pursue a career in public service, nor to run for mayor. No one forced him to wage a campaign to become a Strong Mayor that would provide him with an approximate 150% increase in salary. 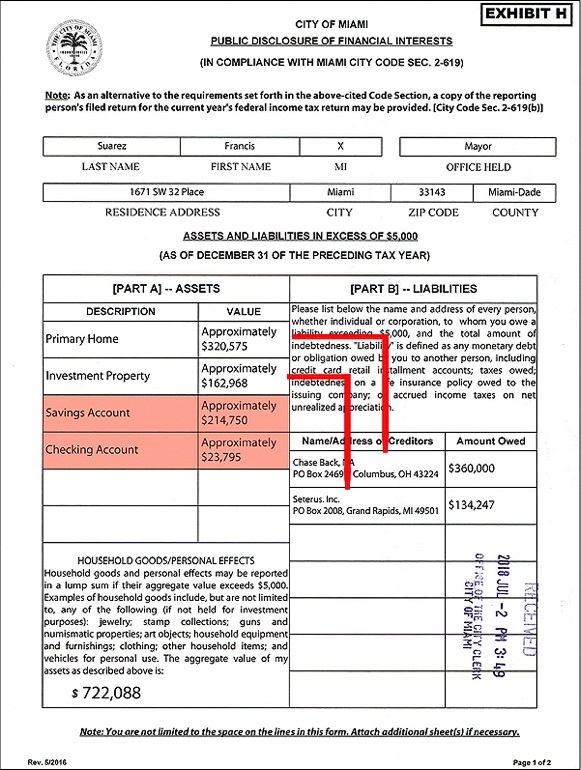 And lastly, no one forced him, in the midst of waging a campaign to become the Strong Mayor to go out and incur the debt that comes with buying a $1.45 million home in Coconut Grove while still having to cover an additional $494,297 of debt from the house he was living in and the ownership of an investment condo. It's no secret that public service doesn't pay well, although bribery still remains a lucrative side hustle for some politicians in Miami thanks to the failure of local law enforcement to do anything about it. For the most part though, folks who choose public service are driven by personality needs that take into account that there is a trade-off between making a lot of money, and serving the public. Money is at the core of many of the stories that I've recently written about Suarez. In an August 25TH story, I wrote about the millions of dollars that Suarez received for his campaign for mayor from developers, contractors, real estate companies and land use law firms who represent clients before the city on a daily basis. As part of that story I questioned what it meant for a land use lawyer who also happens to be the mayor to be able to use the cover of the lawyer/client relationship to shield a lot of activities that might raise ethical or legal questions if the public was able to know who those clients were? This is Miami we're talking about, and the history of bribery, backroom deals and Play For Pay schemes continue to offer the same playground for insider dealing and bribery by Francis Suarez that it has done for some of his predecessors in decades past. You would have thought when I first raised this question a couple weeks ago that it would have awoken even the dumbest of the editors at the Miami Herald and all the "real" new media in Miami. Who other than a politician with insider connections would you even consider being able to pull off a deal like this? I've received calls from a half dozen folks, all with higher net worths and liquidity than Suarez, expressing amazement that he could have gotten a mortgage with so little equity in his existing properties and so small a net worth, and like I have, they too wondered where the $309,000 in cash for the down payment and closing costs came from. In my original story I included a copy of Francis Suarez's latest Public Disclosure of Financial Interests that showed that he had a total of $214,750 in a savings account, and $23,795 in a checking account. This report incidentally was filed only days before the closing on the house was completed. This report also shows that the house that he and his wife were living in is actually under water, with a value of $320,575, and a mortgage that continues to remain at $360,000 year in and year out. Even if he had emptied both accounts to cover the down payment and closing costs he still would have still been short $70,455, and there's no rational reason to believe that he emptied these accounts. In fact, this is one of the questions that the "real" news media should have started asking Francis Suarez the day after I posted my first story: How much money do you have in your checking and savings account today? Where did the down payment money come from? He didn't get it from Daddy Suarez, because Daddy Suarez tweeted me that he had not given his son any money. So that's one money question related to Francis Suarez that deserves a serious looking into by the "real" news media? If Francis Suarez can explain where, and how he got the money to cover the $309,000, then that information needs to be provided and made public. If he can't, or won't, then the public needs to know that to! The whole issue of Francis Suarez's campaign financing is one that both baffles and surprises people who I talk with outside of Miami. Last year, when he ran for Mayor, Francis Suarez campaign account received and spent $1,273,765.80. His political committee, Miami's Future, Inc., received another $1,328,935.00, and spent $897,725.80, for a grand total of $2,602,700.80 in donations, and $2,171,491.60 in expenses. According to City campaign records, only one of the 3 candidates who ran against Suarez managed to self-donate $1,000 to her campaign. The other 2 candidates never received, or self-donated a single dollar. Not only was this an amazing amount of money to spend against 3 individuals would couldn't have gotten elected to the position of the City of Miami's Chicken Chaser, but was really an eye opener was who gave Suarez these millions of dollars, and in what amounts. In addition to the above list I also included this description of others who contributed sizable amounts to Suarez's campaign. Moshi Mana, who now claims to own a large portion of the office buildings on Flagler Street donated at least $5,000 more than the $35,000 he gave to Miami's Future, Inc. directly to the campaign. It is rumored that Francis Suarez' cousin Steve Suarez, who managed his first campaign for mayor until he and the campaign's IT Director were arrested, now works for Moshi Mana. Aabad Melwani, who operates the Rickenbacker Marina on a lease from the city, and who had given Miami's Future, Inc., $25,000, through LAN DOWNTOWN LLC, gave another $17,000 through various companies he controls to the campaign. Robert Christoph Sr and Jr, also donated $25,000 through the company Hook Investments. They and Melwani are tied together in a fight over the RFP/lease for Rickenbacker Marina now playing out in the courts. Michael Simkins, who created controversy with his plans to build a 643 Foot Tower with a 30,000 square foot LED billboard display in Overtown, donated at least $13,000 through a series of companies whose addresses were 301 W. 41st Street, Miami Beach. In December of 2016, and March of 2017, 23 companies sharing PO Box - 330967, Miami, FL 33233, donated $23,000 to the Suarez campaign. The Adler family, who I also wrote about in my series, because they were the behind the November referendum issue to buy the MRC building and then build the city a new administrative building either on the property or elsewhere, and who were represented by the lobbying firm of LSN Partners, gave $10,000. LSN Partners is also where Suarez's former Chief of staff Michael llorente is now a named partner, along with his brother who is married to a cousin of Suarez's wife, who also happens to business partners with Llorente's wife in an event business. The Valls family that owns La Carretta restaurants, bundled and donated $7,000. Developer Jorge Perez came in with at least $8,000, and Boardwalk Properties bundled and donated a total of $15,000 in June of 2017. Donors, such as Wayne Rosen, who had donated $10,000 to Miami's Future Inc., also donated another $7,000 through 7 real estate companies that he controlled. In February of 2017, Jeffrey Berkowitz, who has yet to break ground on his Skyrise Tower at Bayside, and has over the years has given money to candidates in the city like it was Monopoly money, bundled $5,000 through some of his companies to go along with the $12,500 he had given to Miami's Future, Inc.. I ended my story with the revelation that a "homemaker" from the Bronx named Marina Ghermezian had also donated $10,000 to Miami's Future, Inc., in the last days of the campaign. Ghermezian I reported, was the wife of one of the Ghermezian brothers who own the company that developed the Mall of The Americas in Minneapolis, and now want to develop the America's Dream Mall in northwest Miami-Dade County. The list of donors who had ponied up at least $5000 - 156 donors gave at least $5000 - was amazing not only for their number, but also for their obvious ties to and needs from the city's Planning and Zoning Department. 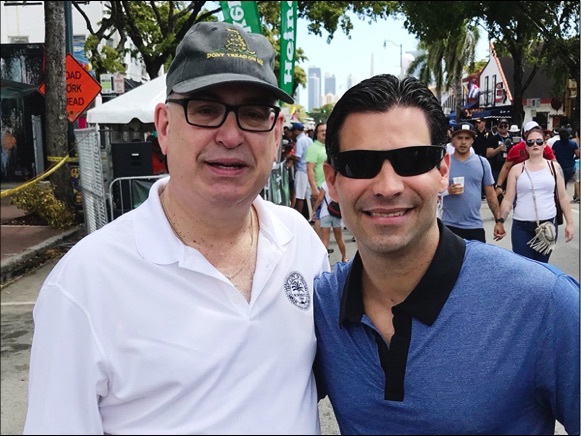 No sooner had Suarez been elected as Mayor that he started a new round of fund raising to underwrite the ballot initiative for his effort to become the Strong Mayor of Miami. Once again, some of the same people who had given Suarez those tens of thousands of dollars above, started showing up in the campaign finance reports for Miamians For An Independent Mayors Initiative, Inc., starting with one of the Ghermezian brothers, who kicked in $10,000. The Ghermezians have no known business interests in the city, but Francis Suarez's father Daddy Xavier Suarez, was one of the county commissioners who voted in favor of their America's Dream Mall, and perhaps when it came time to pass out thank you money Daddy told Syd to give it to his son. The biggest donor to date to this strong mayor initiative is Drive Development, a company that builds high-end houses in Coconut Grove, and who gave Suarez's $75,000. The wife of Douglas Cox, who owns Drive Development donated another $20,000 though another company that she owns, for a total of $95,000 from the Cox family..
West Flagler Associates, who is now in a fight with the city over Commissioner "Sellout" Russell's efforts to create a road block to stop them from building a Jai Lai Fronton and cardroom on Biscayne Boulevard gave him $15,000. 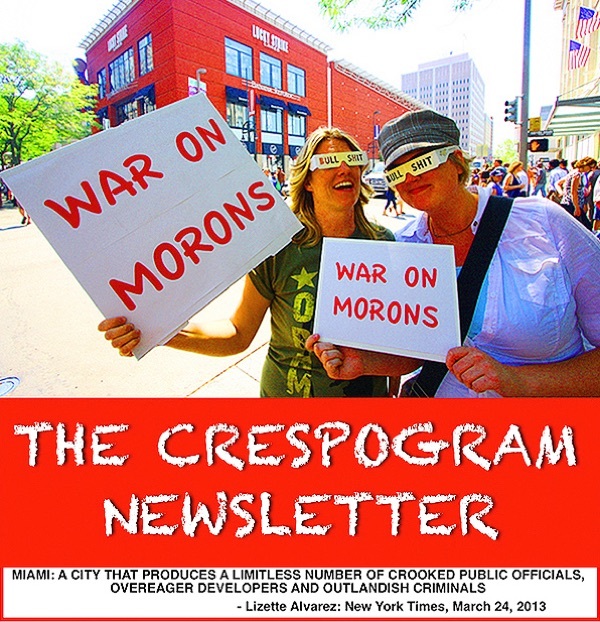 Jorge Perez, who is on the other side of the fight with West Flagler Associates over this project, had his company The Related Group give $25,000, and Norman Braman, whose also opposed to a Jai Lai Fronton setting up a couple blocks blocks from his car dealerships gave $25,000. Midtown Opportunities, the company that I revealed in April had donated a total of $122,500 to Suarez's previous campaigns for Commissioner and Mayor came up with another $10,000. Also giving $10,000 were Astor Development that had previously donated $15,000, and Jonathan Leyva, who had also previously donated $10,000. Oak Plaza Associates, which records show is owned by Mid-Town developer Craig Robbins gave him $25,000, which is $15,000 more than he gave him for his campaign for mayor. Jeffrey Berkowitz and Julio Del Rey, father of Circuit Court Judge Marcia "Goldilocks" Del Rey, and owner of a number of a couple hot-sheet motels each gave $5000 to go with the previous donations to Suarez's PC, and that but a handful of the 58 individuals and companies who donated more than $5000 to this strong mayor effort. The premise behind the campaign for Francis Suarez becoming the strong mayor of Miami is that this is a citizen driven initiative seeking accountability, transparency and efficiency. To date, Suarez has been anything but accountable, transparent or efficient, and the big money donations bely the claim that anyone, most especially Francis Suarez himself have had enough of influence peddlers and special interest lobbyists. Not only do these big money donations reveal that the "usual suspects" that show up at City Hall looking to play, "Let's make A Deal,"are financing this effort, but any claim that this is a grass roots effort is an illusion intended to hood wink Miami voters, who've demonstrated a perennial gullibility when it comes to believing the lies they are told by politicians. Out of a total of a 151 donations to Miamians For An Independent Mayors Initiative, Inc., one person has donated $20, one person has donated $25, one person has donated $33, four people have donated $50, three people have donated $100.00, three people have $250.00, and one person has donated $300.00 for a total of 14 donations that would be considered donations made by small donors. Of all the other 137 donations, 58 of those donations were for amounts of $5000 or more. There was a time when the Miami Herald and the rest of what passes for the "real" news media in this town would have been all over this kind of story. But those days obviously seem to be gone. This is my 5th story since April 9th raising questions about the donations made to Francis Suarez by big money donors who don't give all of these thousands of dollars to politicians without expectation of getting something in return, and since my first story to now, no other news media outlet to my knowledge has bothered to look into all of these donations. 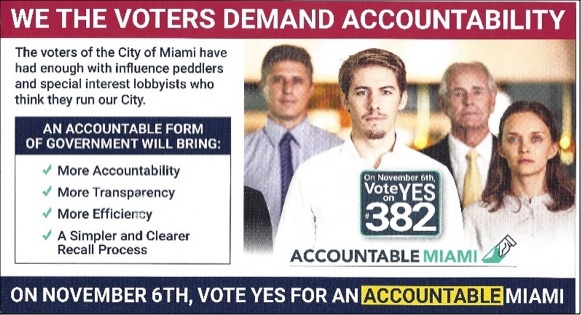 Whether they like it or not, this tells you that they too are in the pocket of politicians like Francis Suarez, and that this is really bad news for the future of Miami, because if the public doesn't know who is giving all this money to politicians, they won't know when the politicians give these donors a return on their investment that will more than likely be paid for by their tax dollars.